It’s possible to stumble upon NASA’s Web site via a random link only to emerge two hours later with a new ultra-high-resolution satellite image of Mt. Vesuvius for your computer’s desktop and a close familiarity with the inner workings of the Orion Nebula. Proving that the stream of free space-related goodies is seemingly without end, NASA has made available a Mars Sunclock, a tool that tracks the current time of day on different parts of the red planet. Mars days (called "sols") are only 39 minutes and 35 seconds longer than Earth days, and the planet’s 25-degree tilt on its axis results in an Earth-like progression of the seasons. 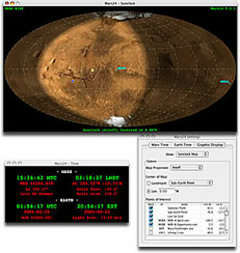 With the Sunclock, you can plot the location of the ailing Spirit and the still-functioningOpportunity rovers, as well as several other Martian landmarks, in relation to the time of sol on Mars. Link (also, check out a similar Sunclock application for Saturn’s moon Titan here).